At World’s Best Cat Litter™, we know the arrival of winter usually means your cat spends more time indoors than any other time of the year. While there’s nothing better than having a warm and fuzzy feline to cuddle with on a cold night, it’s also important your cat gets the exercise necessary to stay happy and healthy. 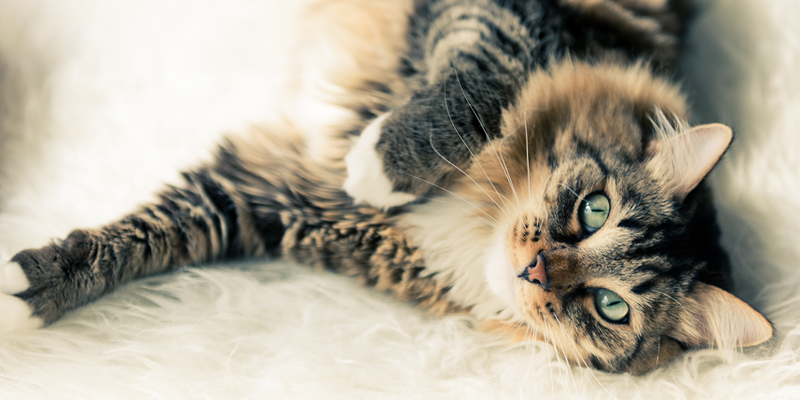 Here are a few hassle-free tips that can help your cat remain healthy during winter months. Whether mental or physical, all cats need a little extra attention when they can’t go outside. And a large part of that is making sure your cat is eating healthily to begin with. We all know how easy it is to start snacking when we’re warm and cozy, but it’s crucial not to let that mentality affect your cat. Regular eating habits are a must for your pet’s body! Talk to your vet to find out what the right nutritional needs are for your feline, and then stick to them year round. If your winters are particularly cold, some vets may recommend an extra teaspoon a day of fatty oils (such as fish oil or canola oil) added to their food. This will stimulate your cat’s immune system and help relieve their dry, itchy skin! Every cat owner knows there’s nothing cats love more than playing! In fact, running, jumping, and chasing are some of a cat’s favorite things to do (right after sleeping)! Yet when your feline is stuck indoors, it gets harder for them to do the activities they’d normally do to stay healthy. It’s important to make time for you and your cat to play. Regular, physical activity will help them exercise and stay engaged, and it will ward off some of the excess pounds a lot of pets pack on during colder months. 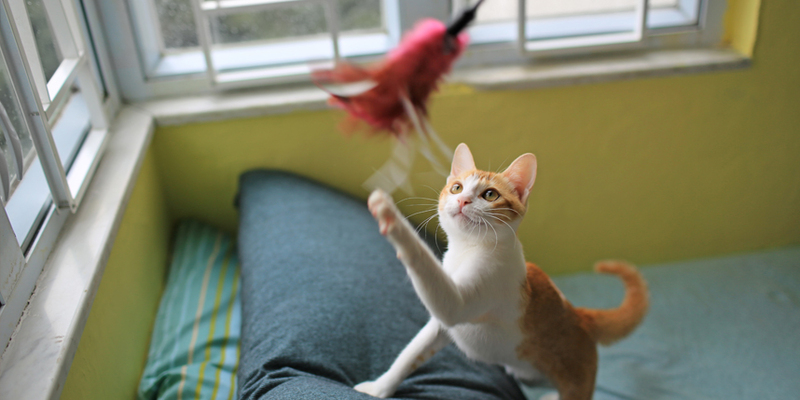 Check out these suggestions of games to play with your cat (most feature toys made out of simple household items too). Cats have notoriously curious minds and are known to get themselves into all kinds of trouble when they become bored. That curiosity only grows when weather keeps them indoors. It’s a great idea to create a special space inside your home for your fury friend(s) to climb on, investigate, and play. Once they learn they have their own spot, they’ll be less likely to get into places they’re not allowed. You can even buy a custom made cat condo, or with a little creativity, create your own. Why not take your cat for a walk? It’s not as crazy as it sounds. Cats love exploring, and more often than not, can learn to comfortably walk with a harness or leash on. (Here are a few tips for first time cat walkers.) Just remember: If you’re cold, so are they. Make sure your strolls are simple and enjoyable for both of you, and be prepared to get them back into warmth quickly if need be. Following these simple tips will make this year’s cold weather a non-issue for you and your cat. Of course, one of the best ways to keep you and your indoor cat happy is by choosing World’s Best Cat Litter™. Cats use the litter box more in the winter and our litter offers outstanding odor control so you aren’t trapped in a smelly home when snow flies. And your feline will love the soft feel of our all-natural, whole-kernel corn litter on their paws. And unlike clay litters, there’s no silica dust for you or your cat to breathe. Do you have tips on caring for your cat during the winter months? Share them below! Here’s to hoping you and your cat have a dynamic, fun, and safe winter! Winter weight gain isn’t just a human issue. But, with these five simple tips, you and your cat can stay fit all year long!